People just beginning their future planning may hear many terms thrown around by their relatives and attorneys: trust, beneficiary, settlor, and more. For those unfamiliar with trusts, the many different words used to describe them can be quite confusing. This article explains how a trust works and who is involved in managing it. Essentially, a trust is a division of property rights. One person holds the legal ownership rights to property, and a different person has the right to benefit from the property. The first person is known as a “trustee”. The second person is known as the “beneficiary”. The person who places the property in trust is called the “settlor”, “trustor”, or “grantor” (all three terms refer to the same person). When the settlor places the property “in trust”, he is really just transferring ownership rights to the trustee. The property becomes part of the “trust corpus” (body). Trusts can be revocable or irrevocable, meaning either that the settlor can undo the trust and retrieve the property again or that he cannot do so. 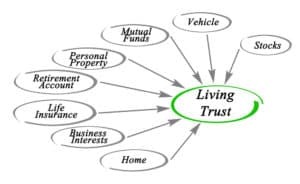 You may have also heard the term “living trust”, which simply means that the property stays in trust during the settlor’s lifetime, then passes to beneficiaries at his death. A charitable trust has a charity or cause as a beneficiary. Settlors sign trust documents specifying the names of the trustee and beneficiary or beneficiaries, the terms of the trust, and other specifics such as which property is part of the trust. Depending on what the trust document says, the trustee may be able to distribute money held by the trust or proceeds earned by property in the trust to beneficiaries either at the trustee’s discretion or upon beneficiary request. Trustees must be careful to follow the trust’s terms, obey specific duties, and act in the beneficiaries’ best interests. For people with special needs, future planning may center around a special needs trust, sometimes called a supplemental needs trust. Special needs trusts exist to support people with special needs while preventing them from losing eligibility for government benefits such as Medicaid. Most special needs trusts are irrevocable trusts. Some are self-settled, meaning a trust created for the benefit of a person with special needs containing the person’s own assets. Others are third-party, meaning someone else is the settlor but the beneficiary is still the person with special needs. There are other variations on the basic special needs trust, such as the pooled trust.